Internalized homophobia, alienation, poor support structures, and high levels of depression all contribute to substance abuse among lesbian, gay, bisexual, and transgender (LGBT) individuals, with social activity at bars and clubs reinforcing addictive behavior. The threat of bias in treatment programs also prevents many from seeking help. 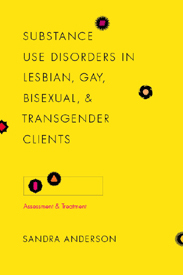 A resource for human service professionals searching for the latest research on these unique issues, this volume features both state of the art practice methods for treating substance use disorders and up-to-date analyses of sexual orientation and gender identity issues, heterosexism, and the ethical challenges of working with the LGBT community. Sandra Anderson discusses practice with individuals, couples, families, and small groups, as well as practice at the program level. Drawing on case studies with her own clients and from social service agencies that treat LGBT clients, Anderson emphasizes evidence-based treatment models, including motivational enhancement therapy, contingency management, the matrix model, and community reinforcement. Packed with recommendations for effective practice, this singular volume confronts the obstacles faced not only by clients with addictions but also by the LGBT population as a whole.